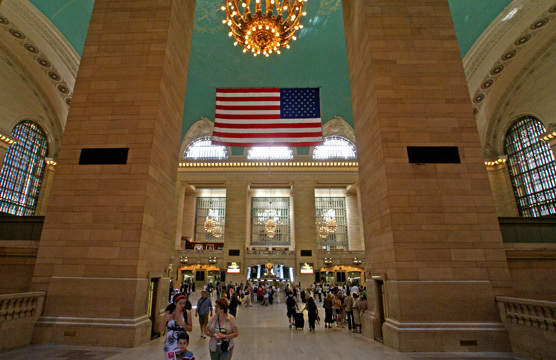 Manhattan's only remaining great gateway, Grand Central Terminal is spectacular in size and function. 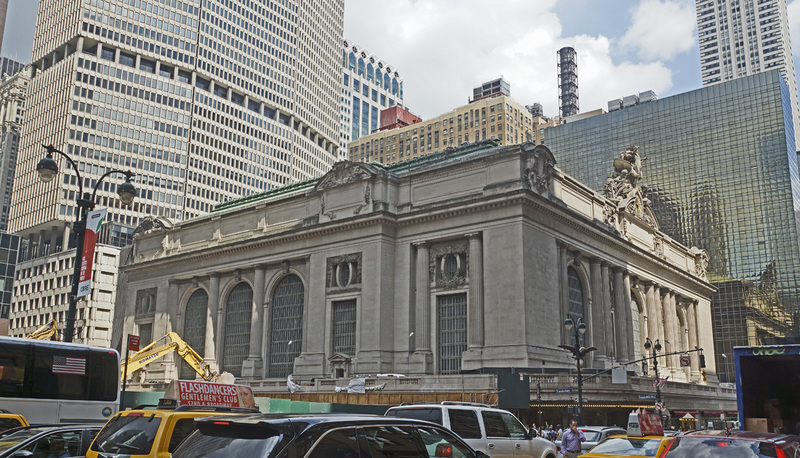 The vastness of the great concourse, entered directly from Vanderbilt Avenue, which is named after the founder of the New York Central railroad, is matched only by the building's status as one of a handful of definitive landmarks of the city. The working, if not symbolic, heart of the city, the space itself probably approaches the limit of comfortable space, smaller but much more complex and "grand" than your run-of-the-mill, late 20th Century, domed superstadium. This Beaux-Arts structure is the core of what was once "Terminal City," an impressive aggregate of interconnected hotels and office buildings all consistently designed by Warren & Wetmore. 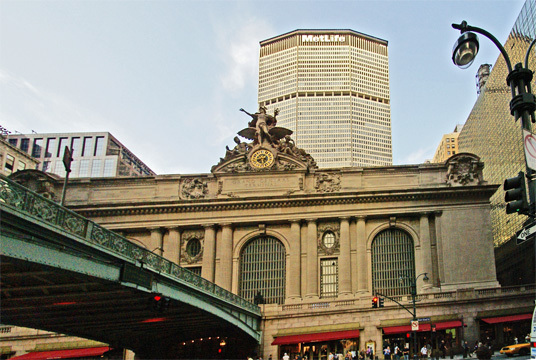 The stunning success of this complex, which was tied into the cross-town subway shuttle on 42nd Street and the IRT Subway line on Lexington Avenue, led quickly to the compatible masonry development of other distinguished office towers in the vicinity such as the Bowery Savings Bank (now the Home Savings Bank) Building and the Pershing, Chanin, Lincoln, Graybar and Chrysler Buildings as well as the Brooks Brothers Building on Madison Avenue and several others. Underground connections to several of the newer buildings were also made. The second most important entrance is from 42nd Street at Park Avenue, which leads directly into the main waiting room and its public restrooms. This handsome, formal space was restored in the early 1990's, but its wooden benches were removed to be replaced with public restaurants as part of the Metropolitan Transit Authority's plans to raise revenues. The agency's pecuniary interests had for decades been manifest in the terminal, especially in the great concourse, where for years an enormous Kodak photomural obscured much of the east end of the magnificent space and a stockbrokerage had its own freestanding stall. Attractive as it was on its own, the photomural's illumination violated and at times blinded the original design of the concourse and was simply inappropriate with the grandeur of the space. With its great arched windows at the east and west, which contain walkways, and large lunette windows on the north and south, the concourse enjoys a fair degree of natural light. In March, 1994, the M.T.A. selected LaSalle Partners of Chicago and Williams Jackson Ewing of Baltimore as the redevelopment team to plan and manage a $100 million renovation of the terminal that would expand its retail space from 105,000 square feet to about 155,000 square feet, improve public areas and restore the ceiling of the main concourse. LaSalle Partners and Williams Jackson Ewing were involved in the much heralded $160 million renovation of the impressive Union Station in Washington, D.C., which restored and converted much of that grand, still functioning rail road station's spaces into a very attractive and upscale retail mall. The renovaton, which included cleaning of the concourse's ceiling mural, also resulted in the creation of a very large and impressive gourmet food market and a very handsome newstand, both at the east end of the building. A few years, Apple opened a large store on the east balcony and a very impressive food market opened up west of the main concourse. 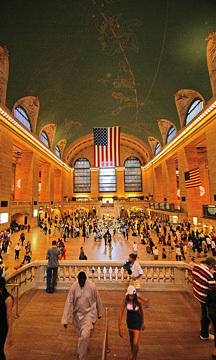 Many of the problems at Grand Central Terminal stemmed from an overzealous commercialism of its grand spaces, which is one of the most valuable real estate locations in the world because of the high traffic counts of well-to-do suburbanites. In a city strapped for cash, such an approach is understandable and it is encouraging that the Grand Central Partnership, which runs the local improvement business district by paying for public improvements by taxing local property owners, launched, under the fine leadership of Daniel Biederman who was subsequently forced to resign inexplicably by Mayor Giuliani, a major improvement program for the area around the terminal. Despite its flaws and mismanagement over the years, the terminal is the nation's premier urban development whose high standards of design and interconnections preceded Rockefeller Center by two decades and remains an awesome architectural treasure despite some terrible surgery to its "Terminal City" complex. The lower level concourse is very large, but has a much lower ceiling. Its principal virtue is that its central ramps lead to the wonderful, and unfortunately not inexpensive, Oyster Bar with its Gustavino-tiled, vaulted ceilings on the intermediate level between the two concourses. Under the major renovation that was completed in October, 1998, these ramps were opened up to permit much broader vistas into the main concourse and to be more inviting. The 42nd Street Station of the Lexington Avenue IRT subway was dramatically renovated in the early 1990's and now is quite attractive with some striking graphics, new flooring, including a large compass, and new ceilings, which, unfortunately, are very low. Beaux-Arts designs tended to be hefty and cumbersome rather than svelte and classically proportioned. Because of its size and prominent location, the main terminal building invites an obvious comparison with the Paris Opera House. While it loses the comparison in terms of extravagant artistry, it wins in terms of public efficiency. A terminal, with an enormous curved skylit train shed and designed by J. B. Snook, occupied this site since 1871, but when two trains collided in the dense smoke and steam of the train traffic in the terminal's tunnel in 1902 killing 17 persons, the state passed a law requiring that trains in Manhattan be electrified by 1910. The railroad's chief of construction, William J. Wilgus, came up with a plan, utilizing electrification and the creation of looped tracks on its lower level, for a new, more efficient terminal that would also improve the value of adjoining property and enable the rail road to sell air rights over its 67 tracks that spread out widely beyond the terminal's above-ground profile. Charles Reed, a partner in the architectural firm of Reed & Stem, which collaborated with Warren & Wetmore on the design of the new terminal, was Wilgus's brother-in-law. Commodore Vanderbilt's New York and Harlem Railroad had rights-of-way on Fourth Avenue dating back to 1832 and his terminal originally was at Chambers Street, but gradually moved north. Automobiles moving up and down Park Avenue navigate around the terminal on terraced and bridged driveways that include also drop-offs for the New York Grand Hyatt Hotel and the MetLife Building. The viaduct across Park Avenue at 42nd Street connecting with the circumferential roadways around the terminal did not open until 1919 and feeds onto the local streets at 40th Street where it also leads into a tunnel that extends to 32nd Street and was originally a cut from the railroad's trains that used the former terminal at 26th Street and Madison Avenue that was replaced by Madison Square Garden. According to Christopher Gray, the architectural historian, the railroad's "Terminal City" complex originally called for the Grand Central Post Office to be a 20-story building occupying a site bounded by 43rd and 44th Streets, Lexington Avenue and Depew Place, but the plans were altered and only a 7-story building between 44th and 45th Streets on the site was built for the post office. The building was later dramatically enlarged for commercial office space above the post office. Construction on Grand Central Terminal started only 9 days after work had begun on Pennsylvania Station, but the terminal was not opened until Feb. 2, 1913, and its upper level loop track system was not operational until 1917 and its lower level loop system was not operational until 1927 when it became able to accommodate 1,000 train movements a day. In his book, "American Building, Materials and Techniques From the Beginning of the Colonial Settlements to the Present," (The University of Chicago Press, 1968), Carl W. Condit noted that "the tracks lay open between the streets north of the station for nearly ten years, war and post-war depression preventing the realization of the air-rights program until 1922." "All air-rights buildings constructed over the track area after the completion of the terminal are supported on columns independent of the track-floor and viaduct framing....The first building to go up was the Park-Lexington (1922-1923), and its structural engineer, H. G. Balcom, was the first to solve the multitude of problems that this novel kind of construction posed. It was the beginning of a brilliant career for Balcom, who had the structural systems of the Empire State Building and Rockefeller Center to his credit before he retired from the profession," Condit wrote. With the decline in railroads, the terminal's visitor traffic fell dramatically, so conceivably the new restaurants will enhance its liveliness and perhaps begin to emulate the hugely successful and very attractive fashion of the rejuvenated Union Station in Washington, D. C. It should be remembered, however, that waiting areas, free of commercialism, are a very legitimate need and use that have been neglected because of public concerns over the unsightliness of the homeless. Such a cavalier disregard for the less fortunate for the visual benefit of the well-to-do suburbanites who have caused much of the city's problems by forsaking their residences here for more racist enclaves is a reprehensible perversion of social responsibility. Perhaps it would make much more common, and public, sense to turn the concourse through which suburbanites travel to major shelters for the homeless and disenfranchised as a very poignant and powerful reminder of civic care! How really great is this space? Not as great as many urban activists and self-appointed preservationists might have us believe, actually. Although there are some attractive escutcheons, decoration is a relative minimum. Indeed, the only important art is Jules-Alexis Coutane's heroic statue of Mercury in front of an eagle, flanked by Minerva and Hercules that perches atop the terminal peering south down Park Avenue, one of the nation's, and the world's, greatest public sculptures. 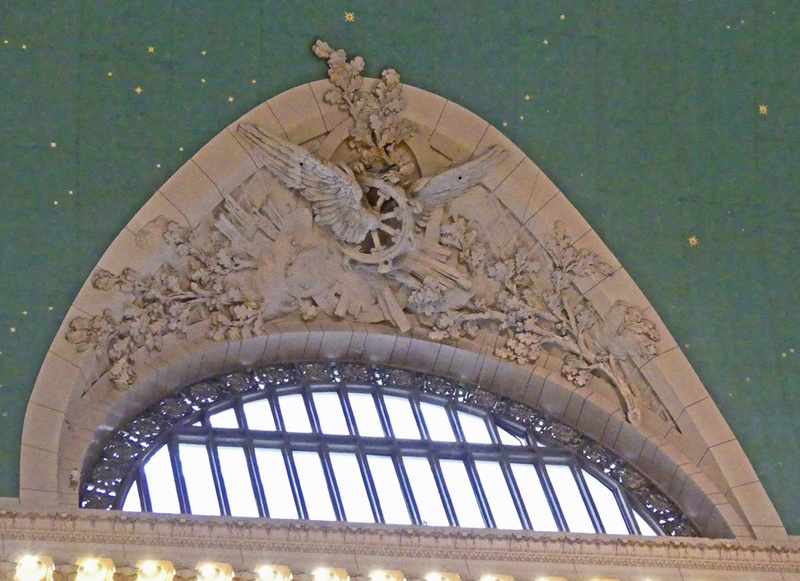 The vaulted ceiling painting of constellations is by no stretch of the imagination of any distinguished value as art. 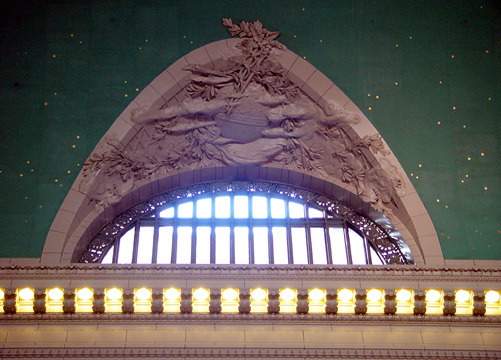 In 1994, the terminal began a restoration and cleaning of the ceiling painting and when it was completed in 1998 it was more legible and brighter, but still a not very imaginative, nor important, painting. 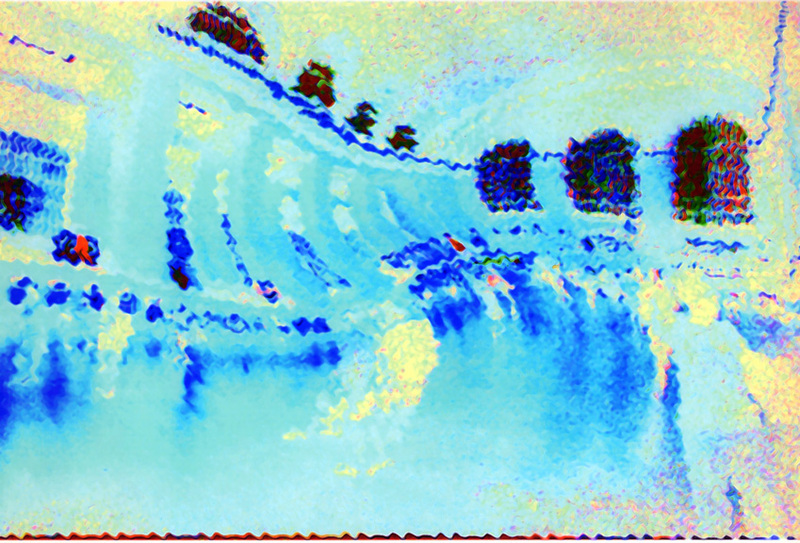 Indeed, the painting is not the original, which was somewhat brighter. The main concourse and its great windows and the ceiling were stunningly explored in the film, "The House on Carroll Street," in which the villain falls through the painted false ceiling from an attic scaffold. A tennis club is above the concourse ceiling as well as some loft space that was formerly used for a while for television studios and also for an art gallery. Michael Jordan, the legendary basketball player, opened a steakhouse on part of the west and north balconies overlooking the main concourse in 1998 and a new grand staircase was created on the east end of the concourse to mirror the one on the east side. The greatest alteration to the terminal, of course, was the erection of the Pan Am (now Met Life) Building directly to the north, which resulted in the introduction of an escalator bank in the middle of the north side of the concourse and, more recently and more regrettably, a glass-walling-off and interruption of the concourse's wide north balcony. The wide, handsome vaulted main Lexington Avenue entrance through the Graybar Building has been repainted and the MTA has improved the retail spaces and created many more in the renovation. The terminal now has a superb and large food hall and an excellent news and magazine store. In the mid-1990's, the M.T.A. announced plans open new entrances to the terminal as far north as 48th Street on Park Avenue to make it more convenient for commuters with jobs working in offices north of the terminal. These will add significantly to the terminal's usefulness as will plans to have the Long Island Rail Road trains stop at Grand Central as well. The railroad's vast tunnel spaces under Park Avenue have provided makeshift and quite dangerous homes for some rather intrepid homeless persons ever since the homeless problem emerged as a highly visible urban problem in the 1970's. It's their city and their terminal, too. 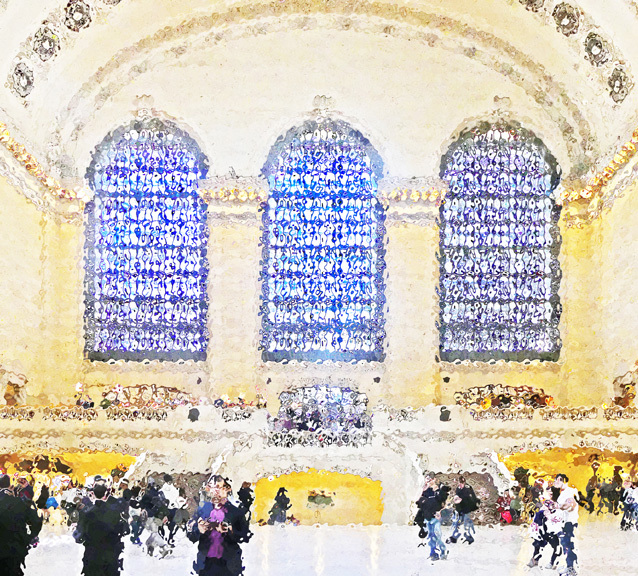 Grand Central has undergone many transformations and fortunately quite well. Its renovations have been expensive, but nothing compared to the outrageous summed contemplated by Mayor Giuliani to build a new stadium on the West Side for the New York Yankees, a scheme that will benefit only George Steinbrenner and was subsequently by an even more grandiose plan known as The Hudson Yards, a gigantic mixed-use complex developed by The Related Companies and Oxford Development..
Grand Central Terminal is awe-inspiring because of Coutane's marvelous sculpture, the vastness of its concourse, now opened up in the 1998 restoration as shown above, and the breathtaking grandiosity of its original planners to planning a major city around it. Would that such visions would occur to the city's planners again. To see illustrations of three different proposed towers over the terminal, see The City Review article on Paul Byard's excellent book, "The Architecture of Additions, Design and Regulation."